Founded by Quetzal Flores in the early 1990s, the Los Angeles-based ensemble Quetzal draws from a large web of musical, cultural, and political influences and commitments. Songwriter and lead singer Martha González calls Quetzal an “East LA Chican@ rock group,” summing up its roots in the complex cultural currents of barrio life, its social activism, its strong feminist perspective, and its rock ’n’ roll beginnings. Martha González, Tylana Enomoto, and Alberto López, of Quetzal rehearse in González’s living room in Los Angeles, 2015. Over the last two decades, the group has released six albums and worked with a diverse range of creative collaborators—both artists and community collectives—including Fandango Sin Fronteras, Great Leap, Mujeres de Maiz, and Los Lobos, among others. 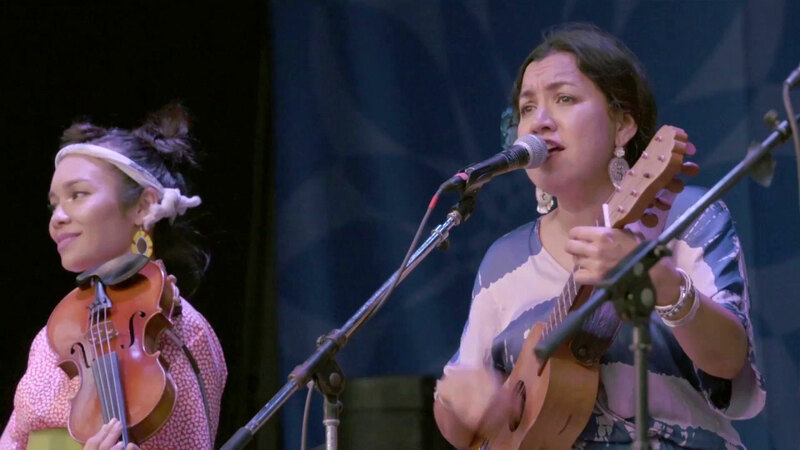 On the GRAMMY-winning album Imaginaries, Quetzal creatively combines the varied strains of East L.A.’s soundscape—traditional son jarocho of Veracruz, cumbia, rock, R&B, and more—with international musics to express the political and social struggle for self-determination and self-representation. Their next album on Smithsonian Folkways Recordings is due out later in 2016.